You can’t turn around in Columbia without bumping into a trail, park or conservation area that you can easily learn to love. We’ve wrangled together some insider info, tips, resources and reflections to help you explore the natural beauty that abounds here, whether you’re walking or pedaling, a first-timer on the trail or an all-season — and seasoned — “pro.” May you be inspired to walk, run, hike and bike as fast as you can to a nearby trail and “naturally” enjoy Columbia outdoors this summer. Columbia’s immediate vicinity boasts more than 50 miles of trails — from dirt paths to wider, multi-use trails that are friendly for walking, biking, running and hiking. If the MKT and Katy Trail crowds get a bit much for you on weekends, you don’t have to go far to find greater solitude: Bear Creek Trail, for instance. Just 3½ miles from the heart of downtown, the trail features a 450-foot boardwalk cantilevered over the creek along a steep limestone outcropping. Other amenities include a wetlands loop trail, beaver dams and other woodland wildlife visible from the path, and urban niceties such as a fenced-in dog park and playground. The Missouri Department of Conservation maintains more than 9,441 acres in Boone County for fishing, hunting, nature observation and conservation education. This includes Rocky Fork Lakes Conservation Area north of town with more than 60 lakes and ponds, and Eagle Bluffs Conservation Area south of town with two trails along the Missouri River that are favored by birders. Missouri State Parks, a division of the Department of Natural Resources, offers Finger Lakes State Park with its challenging 2.75-mile Kelley Branch Mountain Bike Trail and a 4.5-mile water trail. You’ll often run into “trail jams” of people hiking toward Rock Bridge Memorial State Park’s perennially favorites such as Devil’s Icebox. But walk an extra quarter-mile down the trail and you’ll find serenity. 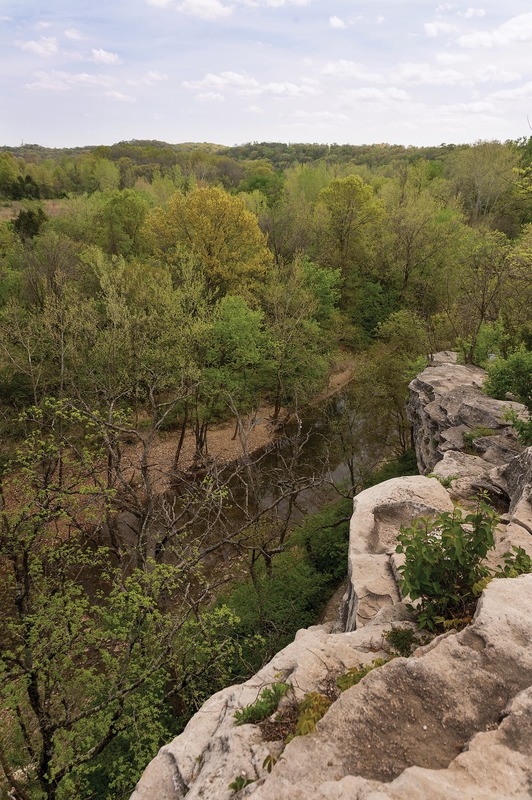 Head a few clicks down the road to the Gans Creek Wild Area Trail System trailhead for a sense of solitude and awe as you hike to overlooks reminiscent of areas deep in the Ozarks. And the best part: You can always find someone to help you find the best way to explore. We share these spaces with some special natives — some of the more than 40 endangered species that live in Missouri. Meet Paul McKenzie, endangered species coordinator with the U.S. Fish & Wildlife Service’s Missouri office, based in Columbia. He and his team coordinate with the Missouri Department of Conversation to help monitor and sustain the well-being of much of Missouri’s wild flora and fauna. Devil’s Ice Box Cave alone shelters three endangered bat species: the Indiana, Northern Long-Eared and Grey Bat. The Pallid Sturgeon meanders its way all along the Missouri River. In nearby fens — groundwater-fed wetlands perched over limestone bedrock — the rare Hine’s emerald dragonfly may alight. At Eagle Bluffs Conservation Area, three federally protected species regularly migrate through: the Interior Least Tern, the Piping Plover and the Red Knot. And while not yet on the endangered species list, the pink planarian population captures the attention of biologists. The rare, free-living flatworm is a CoMo original — found only in Columbia’s Devil’s Icebox Cave, and nowhere else in the entire world. McKenzie hears it all the time: Why care about a blind flatworm or three of more than 40 species of bats in the United States alone? “The loss of diversity is worrisome, and the decline is faster than at any other time in our recorded history,” McKenzie responds. Loss of bat diversity, for example, directly impacts control of insects that are harmful to crops, which has a direct impact on humans. As for the planarian? The cave system’s water source is directly tied to about 13 square miles of surrounding farmlands, homes, businesses and roads. The health of this tiny organism is a bellwether, indicating the quality of the water used by humans, too. Russell Dresbach had done a lot of camping and hiking but had gotten out of the habit. Four years ago, he decided he needed to get back to nature and turned to Google. “Hiking, walking in Columbia” he typed in the search bar, and the Columbia Walking & Hiking Club popped up. Now Dresbach is the lead organizer of a remarkably successful Meetup group providing online information and scheduling that has linked nearly 1,200 people to 661 organized hiking and walking events since it began in 2009. “We do pretty much what the name says. 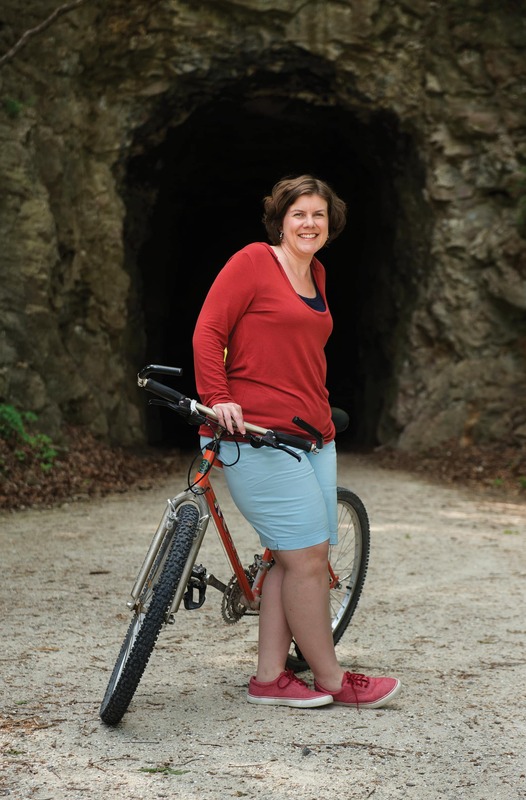 You can look through our past Meetups and see that we walk, hike, camp, bike, float, backpack — or whatever outdoor adventure someone feels like organizing,” Dresbach says. Sign in to the free Meetup app to become a member to see more details about the planned walks and adventures, who’s going and to RSVP. Whether you decide to become a regular club “member” or simply sample a walk or two, the club is a great way to learn about accessible hikes and trails in the area and to explore new places with knowledgeable company rather than going it alone. A great icebreaker to get a feel for the group and one’s own level of fitness is the weekly 6 p.m. Wednesday Evening Walk and Social, meeting at the Stadium MKT entrance parking lot. “Whatever the weather, we’re there. In winter, we bring flashlights,” Dresbach says. On the weekends, the group often embarks on rigorous hikes, day trips or getaways lasting from a few hours to all day. “It’s a great way to experience all the outdoor options there are here without having to figure it out all by yourself,” Dresbach says. Cooper Drury didn’t like the results of his annual checkup and decided he needed to do something about it. 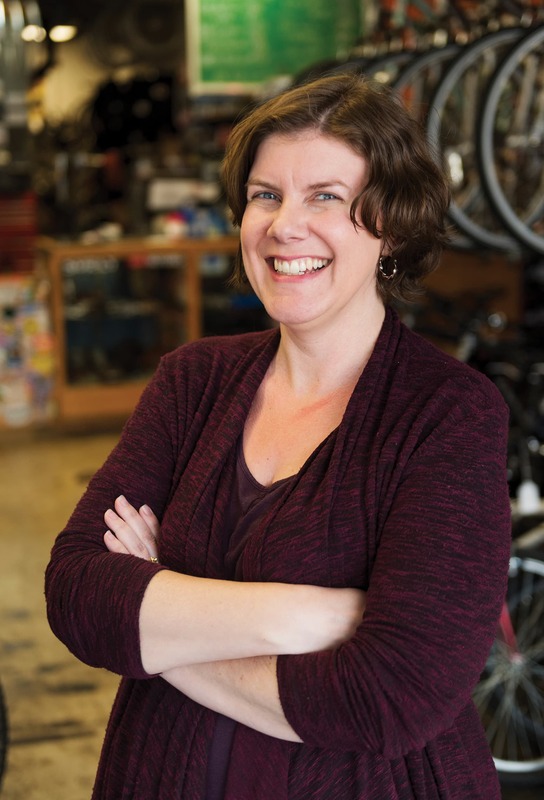 Fast-forward eight years: Drury is president of the Big Tree Cycling Team and a committed road rider who competes in Cyclocross bike race events, too. Why you want to start riding? That’s the first question you should ask yourself, Drury says. There are three main teams in town, each with its focus and character: the oldest and largest, Columbia Multisport Club, focuses on triathletics; Big Tree affiliated with Cyclextreme Bicycle Warehouse, which offers road, trail and gravel and Cyclocross riding and racing, as does Walt’s Bicycle Shop’s team, with more mountain bike aficionados gravitating to Walt’s as well. “We have fantastic roads around here, and the trails are a great resource. But if you start exploring some of the other gravel roads and trails around Columbia and the mid-Missouri area, you will really get an appreciation for just how beautiful this area is,” Drury says. Cooper Drury, inspired by his colleague to get back on a bike after many years, has paid it forward. Audra Jenkins is a graduate studies assistant in the MU political science department that Drury chairs. The love of cycling he shares with his faculty and staff has inspired her to get serious about a birthday wish. She relates her journey here. How to get back on a bike — broken down to the basics. Two years ago, I asked for a specific birthday gift – a bike. Obligingly, my family purchased a basket and pump for me, encouraging me to choose the bike I wanted. As someone whose only adult bicycle purchase was from a neighborhood garage sale in Denver more than a decade ago, I wasn’t quite sure where to begin. A year later, we repeated the same charade. When my birthday rolled around this year, they wouldn’t even discuss it with me. If I wanted a bike, it was time to go get it. Armed with curiosity and a notebook, I tentatively entered the bike world. I armed myself with advice from my Ukrainian biking-enthusiast co-worker, who had cautioned me not to purchase a bike with “POS components.” (“Piece of, er, crap components,” he whispered to me and laughed.) Others echoed this advice, but I wanted to find out what the actual benefits were for heading straight to the experts. Tom Brinker, owner of Cyclextreme, provided several. In other words, buying a bike is like any other investment purchase — spending up means you’ll get more out of it and not have to repair or replace it as often. When you walk into any of the bike shops in town looking for that perfect fit, be prepared to answer a few questions. Bike enthusiasts love helping others become bike enthusiasts, so their goal is always to get you on the bike that’s going to work best for you. It’s a custom experience — your guide may begin to feel less like a bike salesperson and more like a matchmaker. Kyle Nelson, assistant manager at Tryathletics, recommends shoppers “go with the bike that feels the most comfortable,” not just one a friend or someone on the Internet has suggested. “Always ask questions, because there is a good chance we can help adjust the bike or recommend a different style,” he adds. Once you’ve decided on a bike, it’s important to learn the rules of the road (or trail), as well as some basic maintenance. As Karl Kimbel of Klunk Bicycles points out, it does little good to carry the tools for bicycle maintenance if you don’t know how to use them. In addition to the many classes and workshops available around Columbia, he recommends checking out DIY videos on YouTube. Several pages of notes later, I feel as if I have the requisite knowledge to make an informed decision. Next goal? Buying and enjoying a bike this summer, long before my next birthday rolls around. How often do you want to ride? How far do you plan to ride? Do you want to go fast? Do you want to sit mostly upright? Do you have any limits to flexibility or mobility or balance issues? Typically built for style and upright riding on easy terrain, a (Beach) Cruiser, does exactly what it sounds like. Most are single-speed, so don’t expect to conquer Chapel Hill on one of these. A Road Bike is fitted with narrow tires, designed to be ridden on pavement, and is often used for racing. Mountain Bikes have wider tires with deep treads and can handle all kinds of terrain — think off-trail riding at Rock Bridge Memorial State Park. Hybrids come in a few styles, but are designed to be more comfortable bikes with added suspension and a mostly upright seating position for good visibility. Many commuters and recreational riders choose these bikes for their entry-level biking needs. Cylcocross bikes are designed for gravel and other off-pavement riding, versatile for city trails and commuting. They can also serve as beginner triathlon or race bikes. Mark Bendel, service manager at Walt’s Bike Shop, reminds customers to “Think about the whole picture. We don’t want you to spend your entire budget on the bike.” For those entering or re-entering the biking scene, you’ll need a few necessities to get started. Helmet: A properly fitted helmet is a top-priority safety concern. Hydration: Especially if you want to ride long distances, you need to plan how you’ll carry water with you. Most bike frames come ready to install an inexpensive bottle cage directly to the frame. Flat-repair kit: Some basic tools such as a tire lever and a small pump or CO2 cartridge should stay with your bike — but make sure you know how to use them! Bike lock: If you’re leaving your bike unattended, always take a moment to lock it up for safety. Lights: Even if you’re not planning to ride at night, you could be caught out after dark. A bike rack for your car if you want to take on more trails farther from home. Front and rear fenders help keep dirt and mud off your clothes: a good idea for workday commuters. A new seat in a different style may make all the difference in your level of comfort. Racks and baskets provide a system of storage and make the bike more functional. Special clothing (not just race-team Lycra!) helps keep you cool and mobile while riding. 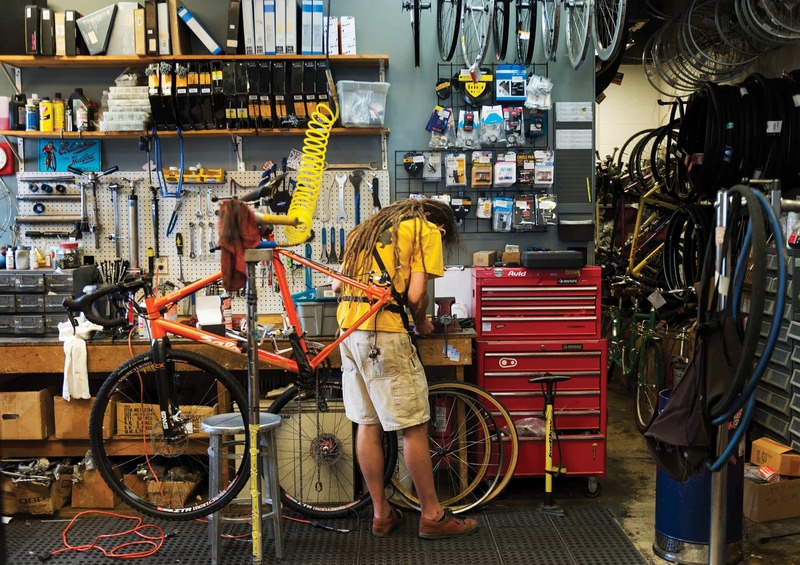 Columbia is a bike-loving city and we have the bike shops to prove it. Check out one or more local bike shops, all staffed by friendly and knowledgeable enthusiasts. The staff can also provide great information about teams, routes and trails, too. Or look for “Local Rides” on their websites. Two rocky blufftops are the “paydays” on these trails in the Gans Creek Wild Area, providing unbroken vistas of hills and trees as far as the eye can see. You don’t have to walk the entire 8.5-mile trail system to reach these marquee features. And mark your calendar for next spring mid-April to mid-May when the wildflower, Shooting Star, provides a carpet. “You won’t believe you’re in Columbia. Really,” says Paul McKenzie, endangered species coordinator with the U.S. Fish & Wildlife Service. The trail takes its name from a breathtaking display of shooting star blooms covering the side of the trail leading to the gorge. While closed for hunting and nesting part of the year, this wetland area includes walkable gravel roads connecting retention ponds rife with water fowl (a couple of hundred species, including three endangered, have been identified there). You can also follow one turnoff to a parking lot along the Missouri River, the trailhead for two riverside trails popular with birdwatchers — one, six miles to the south, and another three miles to the north. A little farther afield, just west of Kingdom City lies the largest prairie in the glaciated plains area of the state, where there is always a seasonal display of wildflowers, including summer fay feather, Liatris, Indian Paintbrush, native sunflowers and more. This road-bike ride takes riders in a 19.75 loop on local roads out to the bur oak tree at McBaine. 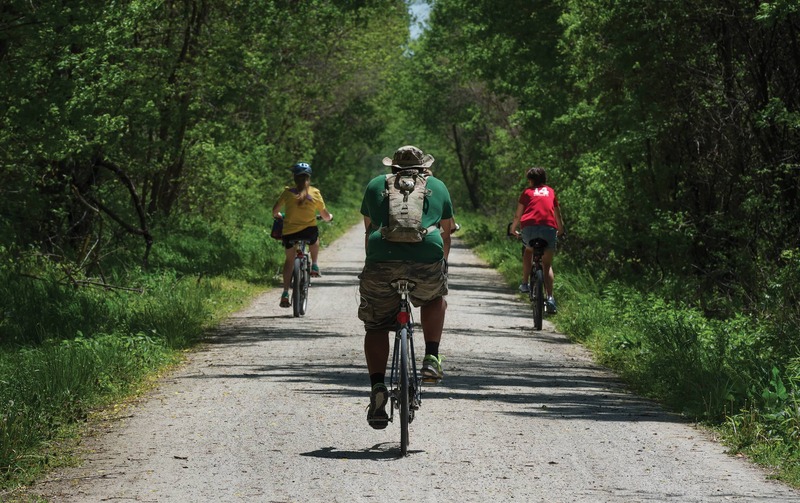 Leave the Katy Trail around Cooper’s Landing and explore surrounding gravel and pavement trails off the Providence Access Road and Smith Hatchery Road. You’ll find beautiful winding roads, gentle slopes and broad vistas, beautiful trees and quiet. And then, you can return to Cooper’s Landing for Thai food at Chim’s and beer on the patio overlooking the river. Big Tree Cycling meets every Wednesday during the summer months at Shakespeare’s South at 5:45p.m. for a comfortable pace, no-drop, team ride that begins and ends at the pizza joint. West of U.S. 63, where Discovery Parkway becomes Gans Road, explore sections of Bearfield and Rock Quarry roads to find winding routes, rock bridges, “little scenic gems,” says Big Tree Cycling Team president Cooper Drury. Rhett’s Run at Cosmo Park carves 4.1 miles of trail through narrow pathways and tight, twisty turns on steep hillsides for a fun, in-town Columbia mountain biking experience. This is a must-have app. Available for iPhone and Android devices, the Go CoMo Trails app provides information about each city trail and the Katy Trail, including where to find restrooms, exercise stations, water fountains and parking lots. The application also provides links to a map of each trail, along with information such as length, access points and other connections. Find it on the Apple Store or Google Play. Shows where most people in an area ride. If you’re new to cycling or to a community, it’s a great way to see what routes most actually use the most. Helps find great rides, map routes, track activity and more.